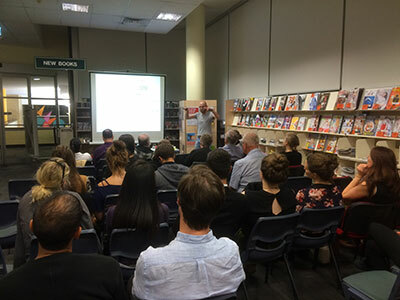 For the past two years, Inspiring Australia has presented regular talks at Ultimo Library, with two early career researchers invited each month to share their knowledge with community members. These events have proved popular with both the scientists involved and library patrons, who appreciate the opportunity to learn more about the relevance of science to everyday life. We are now seeking researchers for our 2017 season, with free presentation skills training provided to participants in February 2017. Talks are generally presented on the second Wednesday of the month from 6 to 7 pm. The format is simple: each researcher speaks for twenty minutes and we take questions at the end. The audience for Ultimo Library Inspiring Science events tend to be people with very little scientific knowledge, so this is a great opportunity for researchers to practice talking with non-scientists. Discussions are always lively and these events provide early career researchers with valuable public engagement experience. Researchers tell us they enjoy speaking with such interested and enthusiastic audiences and find the expeience rewarding. Our first three Inspiring Science library talks at Ultimo Library will have a focus on the future of food. We’ll explore issues from sustainable food production and soil quality to diet, nutrition and robotic farming. Library patrons will be invited to meet experts across a range of disciplines to learn how scientists are contributing innovative solutions to global issues. Kicking off with a panel discussion at Vivid Ideas where the Executive Director of Charles Perkins Centre Professor Stephen Simpson will be joined by writers Charlotte Wood and Alana Valentine in a conversation about obesity, diabetes, heart disease, we’ll spend the next three months looking at the latest advancements in preventative health research. What are the most effective ways to combat the obesity epidemic and where are we up to in Australia today? Why is Australia lagging on international maths and science benchmarks and what do we need to do to reverse this serious skills shortage in science, technology, engineering and maths (STEM)? Over the final three months of the season we’ll consider best practice approaches to STEM learning and some of the national initiatives underway to improve Australia’s international standing in this area. What do today’s students need to know to equip them for the jobs of the future? Please let us know if you would like to be part of this series by sending your proposed topic area and a brief bio to Jackie.randles@sydney.edu.au by 3 November 2016. Interested in talking about another topic? Inspiring Australia is looking to expand this program to other regional libraries including those outside of Sydney. We would therefore welcome topic suggestions from researchers across NSW so that we can work with you to find a suitable audience for your talk. All topics and locations welcome! Access to the February training session will be made available via videoconferencing for those researchers living outside Sydney.